Bankera, after successfully raising €25mil - 9 days ahead of schedule in the largest pre-ICO till date is planning a full ICO to sell 7,500mil Banker (BNK) tokens. The ICO will start on 27-Nov-2017 and run until 28-Feb-2018 for 3 months or after the 7,500mil BNK tokens sell-out whichever comes first. The ICO will be conducted at SpectroCoin exchange, so to be able to participate in the Bankera's ICO and get BNK tokens, an investor would need sign-up for a SpectroCoin account. Assuming that all 7,500mil BNK tokens sell out in a successful ICO, Bankera would have raised €152mil or US$177mil placing it among the top 5 ICOs till date. The current 3 largest ICOs are Filecoin, Tezos and EOS which successfully raised US$250mil, US$232mil and US$185mil respectively. If the 7,500mil BNK token do not sell out, the left over will be distributed among the pre-ICO and ICO participants according to their fractional ownership (or pro-rata) of BNK tokens sold. In other words, after the ICO, there will be 40% of BNK tokens in circulation. Through the clever use of blockchain technology, Bankera, aims to disrupt the traditional banking modals by reducing the number of counterparties and thus lowering the cost of banking to the consumer. One main philosophy resonates well with our views is that Bankera believes that traditional fiat currencies (such as USD, EUR, SGD, GBP…etc) will continue to co-exist alongside cryptocurrencies (such as Bitcoin, Ethereum, Litecoin, NEM…etc). Rather than do away with fiat currencies and become a pure crytocurrency fintech firm, it recognises that fiat currencies are still dominant in the financial services industry. Therefore, it has built its infrastructure to support both fiat and cryptocurrencies. Another concept that we like very much about what Bankera is doing is to introduce a bank account tied to a “basket” to underlying assets that beat inflation. This allows the monies stored on the account to appreciate with or faster than the inflation rate. This modal is adopted from the proposal by Nobel Prize winning economist Robert J. Shiller which is the basis of the widespread fund management and ETFs industry that we see today. The current problem is that most people in general do not invest their money adequately enough to keep up with inflation. For those that do, buying into a fund will lock their money resulting is their financial status becoming less liquid. What if they require the money and need to sell out? Using the blockchains, they can do away with less manpower cost and transact in micro-payments. Therefore selling out of the “basket” or fund each time they need to withdraw a small amount for personal use. It aims to also have advisory or wealth management solutions, will be developed in house based on using artificial intelligence (AI) technologies. 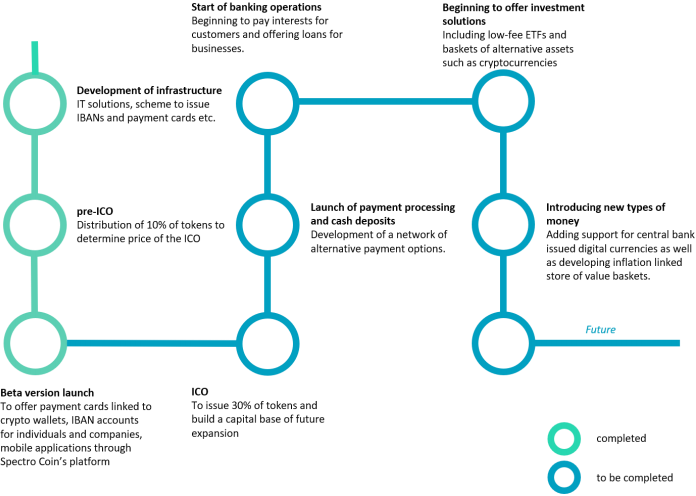 Besides the above novel models that Bankera aims to achieve through its ICO fund raising, it has many other functionality in order to operate a bank. Many of these functionalities are already completed, running and income generating through its current SpectroCoin product. This includes digital wallets that support 22 fiat currencies currently and a number of cryptocurrencies, currency exchange, payments processing, KYC workflows and many others. As it aims to be a full-fledged bank, Bankera targets to ensure that it builds sufficient capital adequacy in order to build a lending business. A large part of the ICO funds will go into securing its funding for capital adequacy. This will allow Bankera to offer lending products in the future. As with all banks, licenses and meeting regulatory requirements are crucial. Currently, Bankera has obtained a payment institution (PI) license and is closed to obtaining an electronic money institution (EMI). The key milestone that Bankera aims to achieved after the ICO is to upgrade the EMI license to a banking license in the EU by early-2019. ProButterflyTM intends to subscribe for this ICO as we think that Bankera has much to offer. If they succeed in their targets in the coming 3 to 5 years, we could see a high upside. First of all, Bankera already has a ready product in the form of SpectroCoin which is already operational and income generating. Till date, SpectroCoin has about 400,000 accounts and are adding more accounts - about 1400+ new registrations each day. It has issued more than 63,000 debit cards with an average daily transaction volume of approximately €580mil. We also like the fact that it’s ICO is conducted over SpectroCoin which means that every BNK token investor is also a client of Bankera. This way, both the clients and the investor has an aligned interest. This will boost demand for its services and account opening rate. Participants in the ICO and holders of the BNK tokens will be able to pay for Bankera services and products at a discounted rate. More importantly, BNK token holders are entitled to an allocated commission of 20% of net transaction fees paid by Bankera and SpectroCoin customers on a weekly basis according to their factional ownership. This can be thought of as a form of dividends with an estimated 2.5% to 3.5% yield based on our experience during the pre-ICO. We like dividends and it give us income while waiting for the capital appreciation from BNK tokens. The core team in Bankera is also backed by strong leadership and recognised names in the crytocurrency and blockchain field. The CEO is Vytautas Karalevičius who is currently completing a PhD in cryptocurrencies at KU Leuven University in Belgium and is the co-founder of the successful SpectroCoin exchange. Vytautas was also among the candidates that stood for the Bitcoin Foundation Board elections back in 2014. Vytautas is backed by a strong advisory team including Lon Wong is President of NEM.io Foundation and Antanas Guoga & Eva Kaili who are members of European Parliament. Lon Wong is also a veteran investor in the blockchain industry. Investing in Bankera is not without its risk. Investing in Bankera is not without its risk. As uncertainty surrounding regulatory and government relationships can sometimes throw planned schedules out of the window. Investors need to recognise that Bankera could experience delays in trying to obtain its EU Banking license. This delay will drag its plans longer than expected. Just like any start-up, business or company, having a good business plan and strategy is only half the story. 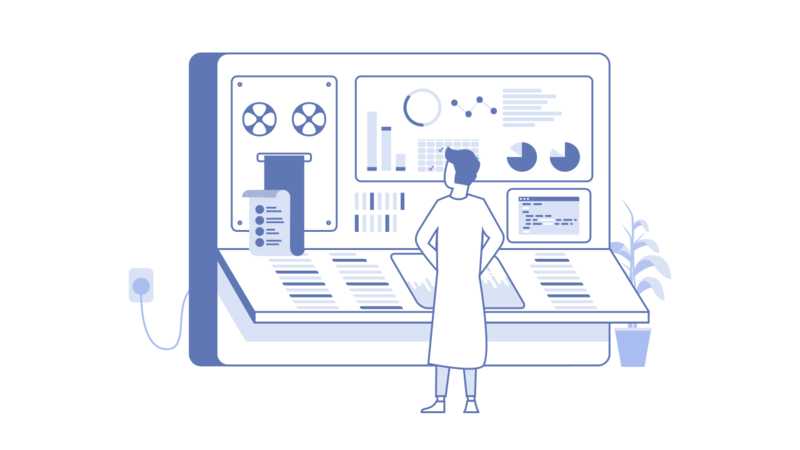 Bankera could experience execution risk in the form of technology problems, processing issues, unfamiliarity in the banking sector operations, bugs in their software and other execution risks. These may set Bankera back longer than expected which will consume their funding. While there are many things to like about Bankera, we also recognise that there are inherent risk investing in early stage startups. Therefore, we are willing to take a bet on Bankera while still cautious of the risk ahead. We see that the upside for Bankera is very high but certainly want to manage the risk of our downside. This is certainly not an investment that we will put our hard earned life savings into. Instead, we will take out a small part of our portfolio to bet on this potentially high growth business. This small part of the portfolio is something we know if completely lost, will not affect us badly. If Bankera succeeds in its targets, we will be happy to ride the upside. If it fails, we are prepared to lose all the amount that had we invested. We will use this guide to size our portfolio. Finally, if you believe that the Bankera ICO is something you would like to participate in, we would appreciate that you use our referral code for Bankera at https://bankera.com/?ref=2260164077 and SpectroCoin at https://spectrocoin.com/en/signup.html?referralId=2260164077 as it will benefit both parties. Before investing, make sure you have ready the Bankera whitepaper which is available from their site and understand the risk involves while taking into account your own financial situation. Never invest what you cannot afford to lose. Ensure that you read the details in their whitepaper and understand the benefits and risk before investing. Join their Telegram and Community Chat channel to find out more, post your questions and have them answered. 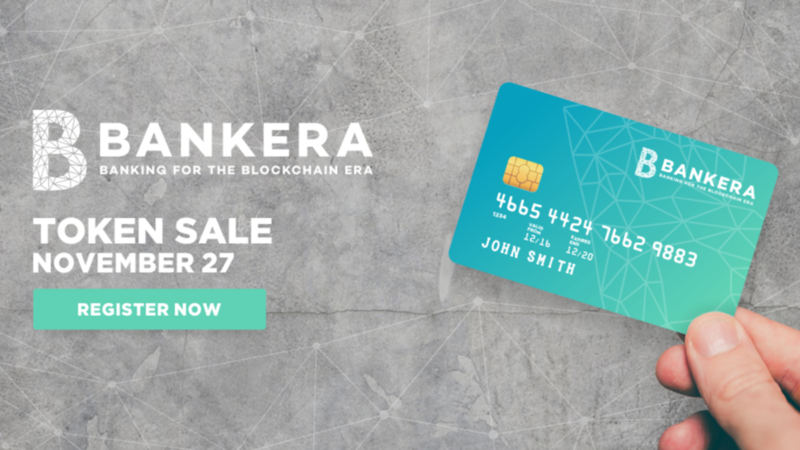 Bankera Review – BNK ICO Bankers Tokens Banking Blockchain Payments? In order to participate in Bankera's ICO, you will need to open a SpectroCoin account here at SpectroCoin.com. Fund your SpectoCoin account with Bitcoins, Ethereums or any supported cryptocurrency of your choice. We reiterate that this is NOT investment advice and this is NOT a buy/sell call on Bankera. ProButterflyTM is NOT your investment advisor. The risk of investing in cryptocurrencies and blockchain related startups is extremely high and you may potentially loose all your investment capital. If in doubt on the action you will take, please consult a professional certified financial advisor. The author intends to subscribe to the Bankera ICO. 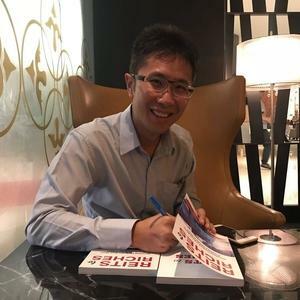 The author at time of writing holds BNK tokens purchased during the pre-ICO stage.